Since ancient times, Russians have believed bread is the staff of life. This popular saying reflects the very significance for humankind of such areas as agriculture and grain production. Food supply is the main resource of life, while the level of food production is the primary measurement of living standards. In this connection, Russia is seriously concerned about the persistent acute global food crisis. Many factors contributed to its evolution: world population growth, changing diet patterns, development of bio fuel production from raw produce, climate change impact and more. Last spring, food prices in world markets increased 55 pc as compared to a year earlier, while rice prices in Asia almost tripled. The spike in prices on staple food products severely hit poor countries, where household food costs are on average 50-90 pc of the family budget. The level of hunger in the world is not decreasing and about 950 mn people are afflicted by famine; the issue is not just plain malnutrition, in many cases, it is outright famine. In the 21st century, this should sound especially outrageous, but such are the facts. In a number of countries, where food production is underdeveloped due to climatic conditions, the situation remains extremely unstable. It is understandable that today the focus has shifted to the economic crisis, yet food market problems have not dissipated. Moreover, they will remain urgent during the period of crisis recovery. Global consumer demand for food commodities has decreased across the board. The food basket in rich countries has been pruned down and now contains cheaper products. In poor countries, hunger is on the rise. The "golden billion" is now offset by the "hunger-struck billion" - those whose incomes, according to international classify cation, are not enough to receive food products at even the minimum necessary level. Тhere is currently a sharp increase in grain demand, because sustainable supplies, and access to them, are at the core of social and economic stability in a number of developing countries. Experts assert that by 2030 global grain consumption is projected to increase by 30-40 pc, therefore, the international community is not assured against new waves of the food crisis. In this context, we welcome the idea to establish a global food reserves management system, articulated at the G8 Agricultural Ministers' Meeting in Treviso. Its realisation is deemed not only to facilitate grain supplies in the form of humanitarian aid to countries in need, but also to reduce the risks of the world food market itself. Yet it is important to reach a fair balance between the benefi ts of the export of food surpluses and the potential "dependency syndrome" (when regularly "fed" recipient countries may lose the spur to resolve existing problems by their own means). Grain production is Russia's traditional industry. Thus, its development determines the availability of bread products as well as efficiency of livestock production. Grain sales form the main share of profits of agricultural producers. Last year, favourable weather conditions, high natural fertility of arable land and timely government fi nancial assistance to agriculture resulted in a record grain output of recent years: 108.4 mn tonnes. Russia is determined to pursue this policy despite the economic downturn. I would also like to point out the possibilities for expansion of area under crop in the majority of the regions of the world have been exhausted. Meanwhile, Russia is a leader in terms of area and quality of agricultural land. That is why, since 1889, the International Bureau of Weights and Measures (Paris) keeps one cubic meter of Voronezh black soil - a sample of soil structure and fertility - next to the platinum meter bar. Russia owns 40 pc of overall black soil - soils with the highest natural fertility - which represents a significant competitive advantage. Moreover, in the situation of the current food crisis, development of 20 mn hectares of Russian agricultural land, unused since 1991, could be re-launched. With a 14 pc share in areas under crop, Russia's share in global grain production is only about 5 pc. In this regard, our prospects as a world exporter are clear. Effective use of Russian biological land potential and the shift to a full-scale production system matching bioclimatic areas could present an attractive solution. However, further studies - that will involve expert and scientifi c community - are needed. Russia is aware of its responsibility and committed to realising its enormous agricultural potential, bringing grain production to such a level as to ensure, together with other major agricultural producers, food security for a substantial part of the world population. It is quite feasible to achieve this goal, which seems to be proven by Russia's re-accession to the "club" of leading global wheat exporters. Thus, in the season of 2008/09, Russia is anticipated to supply about 21mn tonnes of grain to almost 50 countries. Highquality soft wheat is most in demand, since both developed and developing countries use it for fl our production. Thus, in contributing to global food security, Russian grain ensures substantial food supply in a number of countries. Russia intends to expand its grain supply by entering new South-East Asian markets (with possible arrangements for the Eastern Development Corridor), and diversify its export mix through raising the share of processed grain products. We are prepared to take additional measures towards increasing production efficiency in agriculture and toward creating a favourable environment for innovation and access of efficient agricultural producers to land and capital. organisations face a particularly important task to put forward a research programme on such issues as development of technologies and providing access to them to all countries. In particular, the issue of including the supply of equipment and technologies into food aid programmes for developing countries to promote domestic agrarian production is on the agenda. Agricultural production can only be effective if there is an appropriate storage and transportation infrastructure. Therefore, the most important task for the near future is to ensure active support for infrastructure projects. This includes upgrading and creating new elevator capacities, developing the system of transport networks and transhipment facilities of sea and river ports. Russia's United Grain Company is responsible for ensuring active state policy in this respect as well. It will act in the grain market like any other operator, but at the same time, it will pursue certain State tasks, such as food intervention operations and food supplies under inter governmental agreements. 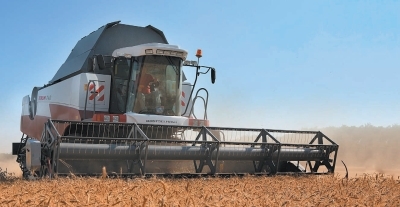 108,4 mn tonnes of grain harvested by Russian producers in 2008 - the largest harvest in 18 years. Nearly 21 mn tonnes, or close to $5 bn, total grain and flour deliveries at the end of the 2008/2009 season - also a record. 125-130 mn tonnes of annual grain production and 30-40 mn tonnes of grain export is what Russia hopes to achieve in the near future, according to Alexander Petrikov, the deputy head of the Ministry of Agriculture.